This note was originally published at 8am on August 18, 2011. INVESTOR and RISK MANAGER SUBSCRIBERS have access to the EARLY LOOK (published by 8am every trading day) and PORTFOLIO IDEAS in real-time. I was on what we affectionately refer to as a Hedgeye Client Roady in New York City with our all-star European analyst Matt Hedrick yesterday. It was hot. We were sweaty. And, oh, were we all beared up (to be “beared up” means to be Bearish Enough). 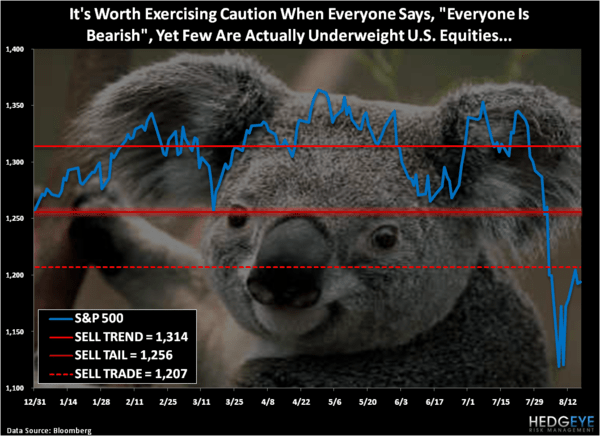 Is the Sell-Side Bearish Enough? Given that most of the Bullish Babble I have been reading from Wall Street’s “Sell-Side” (investment banks and brokers who market the Perma-Bull) in 2011 has not yet turned bearish (never mind Bearish Enough), the answer to that question is unequivocally no. Is the Buy Side Bearish Enough? The “Buy-Side” (asset managers) is definitely not bullish like the Sell-Side. But I don’t think they are Bearish Enough yet either. There’s certainly a qualitative element to that conclusion (my gut), but there’s also quantitative evidence (S&P Futures down -23 handles this morning and yesterday’s Institutional Investor Sentiment survey showed only 23.7% of people admitting they are bearish. Wall Street/Washington “blue chip” forecasts on US GDP Growth continue to be so far away from the area code of reality that S&P actually looks accurate (S&P cut its Q4 US GDP estimate to 1.8% yesterday – Hedgeye’s Q4 GDP range is 0.6%-1.3% for Q4). From a risk management modeling process perspective, we use a range because we aren’t yet dumb enough to take the government’s word for it when they can revise the GDP number down by 81% in 3 months (Q1 2011). In terms of Global GDP Growth, Morgan Stanley is snagging the #1 “Most Read” headline on Bloomberg Economic News this morning by “Lowering Global Growth Forecast” by a whole 30 basis points to 3.9%. Oooh, lah, lah… the bearishness of it all. Meanwhile, the Global Macro Economic Data continues to confirm our baseline case for Global Equities – that stocks will be assigned a lower multiple because A) the Street is using the wrong GDP and earnings numbers and B) The Stagflation earns a much lower multiple. SINGAPORE (ASIA) EXPORT SLOWDOWN – exports down -2.8% in July (that’s a year-over-year number!) and if you didn’t know that the Singaporeans A) advise the Chinese and B) were dead serious about what they said on growth when I signaled it last week… now you know. BRITISH STAGFLATION – after reporting a whopper of a Consumer Price Inflation (CPI) number for July on Tuesday (+4.4% y/y), the Brits printed a 0.00% Retail Sales growth number for July this morning. ZERO growth + inflation = The Stagflation. AMERICAN STAGFLATION – yesterday’s Producer Price Index (PPI) for July came in at +7.2% year-over-year growth and this morning’s Consumer Price Inflation (CPI) print should be close to +3.5% y/y. ZERO point 36 percent Q1 GDP Growth + 1.3% Q2 GDP Growth + Inflation readings that are orders of magnitude higher than real-growth = Le Stagflation, Monsieur Bernank. So what do you do with that this morning? Hopefully the answer to that question resides in what you’ve already done to preserve and protect your family’s capital. 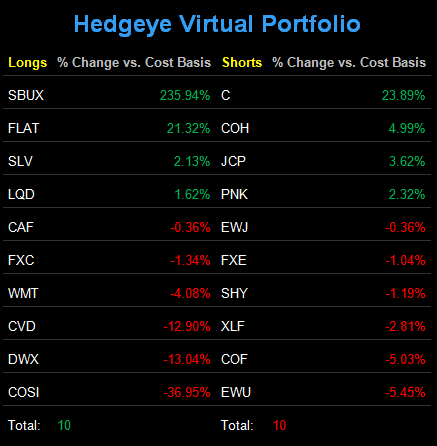 We’ve already made the “call” to go to ZERO percent asset allocation to both US and European Equities and on Monday we cut our asset allocation to Chinese Equities in half (from 6% to 3%) in the Hedgeye Asset Allocation Model. While plenty of Fed Heads have changed their tunes to a more passive-aggressive Rick Perry sounding country song in the last 24 hours (Bullard, Fisher, Plosser, etc), I have not changed mine. I am forecasting, confidently, that market prices will vary – and that managing risk starts with accepting uncertainty. My immediate-term support and resistance ranges for Gold, Oil, and the SP500 are now $1755-1834, $80.07-89.87, and 1172-1207, respectively.